Students from the Santa Susana Instrumental Music Program have gone on to attend many prestigious colleges, music conservatories, and professional industries including Berklee College of Music, CSUN, CalArts, UCLA, Pershing’s own Military Band, Broadway, Hollywood, and many more.At Santa Susana, we cultivate a culture of inclusion, family, and positive experiences for students. Through our many collaborative performance opportunities, students and parent boosters along with many local stakeholders work together to put on fun, entertaining, engaging, and challenging performance opportunities. We host the SCSBOA Music Ratings Festival here on campus. This event is widely respected in Ventura County and allows for many Southern California Bands & Orchestra's to have a professionally adjudicated Festival Experience.As an entity, the program is growing in size, stature, and in it's ability to connect and serve its community. As a home for students to individually grow, SSHS Instrumental Music is a wonderful place for students to call 'home' while developing into caring, qualified, and vibrant young humans. The Academy of Instrumental Music at Santa Susana High School is a high quality music program with a great tradition of success. Whether it’s performing World Class Musicals and Show Productions here at home, receiving High Honors at Regional Festivals, or traveling and performing around the nation, SSHS Instrumental Music enjoys a great reputation of excellence. Our program is a vehicle for students to connect to their full potential. Technical aspects connect with Social/Emotional components every day in the classroom, which has a profound impact on student lives. Using Instrumental Music to create caring, thoughtful, creative, innovative, and integrated young citizens is our goal. Whether pursued as a career, a pathway, or enrichment while pursuing other academic goals, Instrumental Music Students graduate our program, armed with a unique set of life skills that will benefit them wherever they go from here. Santa Su’s instrumental ensembles Production Orchestra, Jazz Ensemble, Entertainment Ensemble, Orchestra I, and Orchestra II, have all earned superior ratings at numerous national and local festivals. All Ensembles are by Audition only. Students have the opportunity to travel both nationally and internationally, providing them with opportunities to perform in amazing locations and learn about different regions and cultures. Community involvement also gives the SSHS Instrumental Music the ability to perform at the Reagan Library, and various local events in Simi Valley. Working with expert professional performers and teachers also gives the students professional level experiences. With opportunities throughout the year to collaborate with theatre, film and stagecraft students, as well as professionals in the industry, instrumental music students will gain an understanding of all of the options within the music profession. Most importantly, students get to take part in three instrumental music concerts per year, each with its own theme, allowing band & orchestra students to develop their performance skills in front of a live audience. As the capstone course, Production Orchestra performs World Class Musicals twice a year (Grade Levels 4,5,6 and beyond). The Musical level is straight from the Professional Productions and require the most developed of skilled Instrumental Technique. Instrumentation for this class is based on the selected shows on a yearly/semesterly basis. 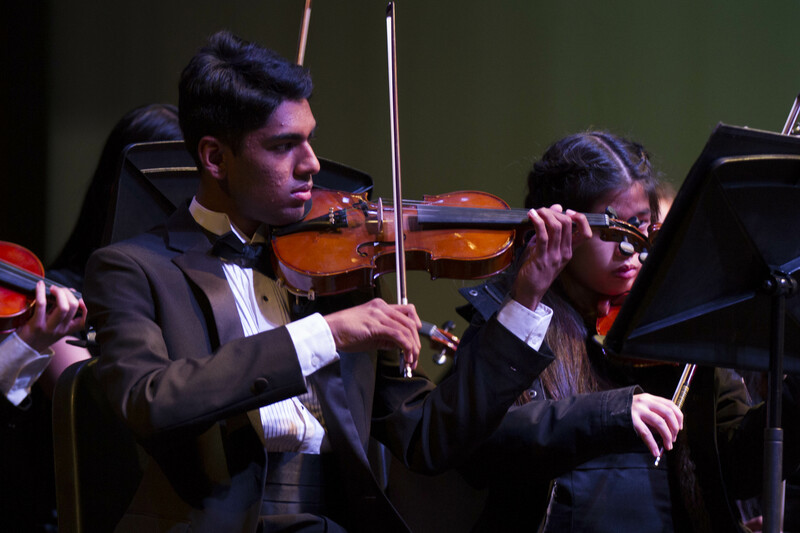 Students in Production Orchestra are required to also participate with Orchestra II’s Festival Performances, and private lessons are encouraged along with Auditioning for additional Honor Groups. This class has significant after school time commitments such as approximately 2 weeks of Tech/Show Call Times. In addition to Tech, this group rehearses period 8 which meets on Mondays and Wednesdays from 3-5pm. This Ensemble is designed for 9-12 Instrumental Music Students to embellish their performance skills with movement, stage skills, and music/visual coordination aspects of live performance.This class is available for Instrumental Music students from ALL INSTRUMENT FAMILIES, and of ALL LEVELS OF TECHNICAL DEVELOPMENT. Students taking Entertainment Ensemble for PE credit but MUST ALSO BE ENROLLED in an approved/auditioned Core Instrumental Music Class at the same time. (i.e. Orchestra I,II, Jazz). Instead of fielding competitive Field Shows, this group will learn 2 stage performances that will be featured at high profile events throughout the community and Greater Los Angeles Region along with both Fall Concerts, Spring Concert, and School Rallies. Future Performances may include the Ronald Reagan Library, Halftime Entertainment at Large Sporting Events, Traveling and performing at Various Sightseeing Destinations (i.e. Hawaii, Europe, various U.S. etc.). This ensemble is designed for our underclassmen and is considered a core music class focusing on the classic fundamentals of musicianship. It consists of woodwinds, brass, and percussion students with prior fundamental training. Literature will range from grade 2-4 throughout the year based on appropriate application. Emphasis will be placed on the fundamentals of individual and ensemble responsibilities. The Concert Band performs in the fall, winter, and spring concerts, the SCSBOA Santa Susana Festival in March, and graduation. This ensemble is designed for our upperclassmen and is considered a core music class focusing on the classic fundamentals of musicianship. It consists of strings, woodwinds, brass, and percussion students who are developing into more advanced skill sets and abilities. Literature will range from grade 3-5 throughout the year based on appropriate application. Emphasis will be placed on more challenging and simultaneous performer responsibilities. Orchestra II performs in the fall, winter, and spring concerts, our Home & Road Shows, Music Ratings Festivals in the Second Semester, the Ventura County String Exchange (for string players), and graduation. Private lessons are encouraged. For Rhythm Section members (Piano, Jazz Guitar, Drumset, Standup Bass), Brass Section (Trumpet, Trombone) and Woodwind Section (Saxophone family). This class is intended for moderate to advanced instrumental woodwind, brass, and rhythm section musicians to study the elements of jazz literature and improvisation. Big Band and Jazz Combo components will be utilized for all students to maximize performance and learning opportunities. Depending upon Combo participation, some combos may be performing at a myriad of school and local community events. Many event invitations occur throughout the year and are chosen based on student availability and investment. The entire class will perform at both fall concerts and the spring concert, Swing Night in February, several Jazz Festivals in the Spring Semester and graduation in June. You must also complete a senior project. Certification with Honors also requires you to Letter at least once in Instrumental Music, and 4 years of ensemble enrollment are required to certify with honors in Instrumental Music. High Honors also requires you to Letter at least once in Instrumental Music, 4 years of ensemble enrollment, and at least one year of Production Orchestra, are required to certify with High Honors in Instrumental Music. 40 units minimum needed to certify in Instrumental Music.